Welp, it's launch day for Starbound. It took almost two years. 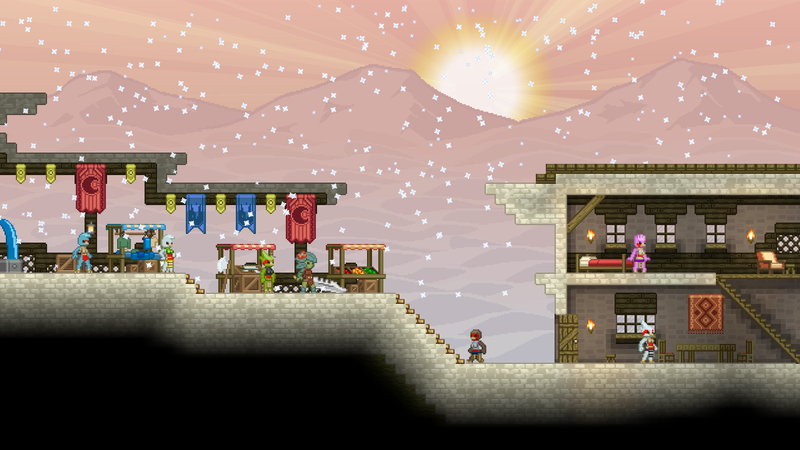 Since its initial announcement in February 2012, Starbound has been slowly getting bigger and better under the care of developer Chucklefish—honestly, when you're making a game about exploring procedurally generated universes, and want it to actually look good and play well, feature creep is pretty much a given. Still, in an impressive display of trust, the community has amassed a total of over two point five million dollars since pre-orders have opened in April. All this culminated in the announcement of the public beta, which is starting, well, today. It should be a rough ride, with the game changing rapidly and worlds/characters getting deleted all over the place, but hey, a beta's a beta. But even if you're not taking part in the great bug hunt, you get to take a look at Starbound's shiny new beta trailer, which does a great job at showcasing both the game and its excellent soundtrack. And for those of you who are still on the fence (or who just want something to pass the time with), there already are several let's plays out in the wild courtesy of some big-name YouTubers, including Etho, TotalBiscuit, and Zisteau. Perhaps a direct look at the gameplay will convince you. In any case, look for Starbound on Steam later today.